Ven. Sugatananda, 36, was born in Calcutta in a typical Indian Hindu family. After his schooling he went on to study Law and completed his Masters LLM in National Law University. He was well established at a legal company in New Delhi until the spiritual call came from within. After a search he came in contact with Buddhism and started studying Buddhism. 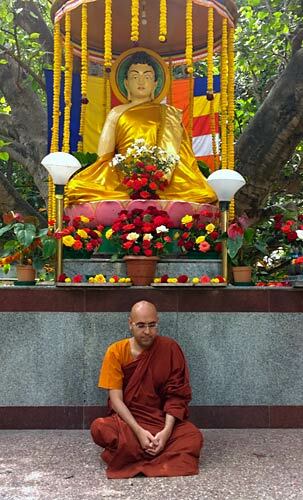 As his interest and dedication became deeper and deeper he decided to renounce worldly life and took to monkhood at Mahabodhi Monastery in Bangalore. He underwent 3 years intensive Buddhist training under the tutorship of a great Buddhist scholar of modern times, Most Venerable late Dr. Acharya Buddharakkhita in Vinaya, Sutta, Abhidhamma and Pali language. He edited and published books written by the Ven. Acharya and he became editor of monthly Buddhist magazine, DHAMMA, which he continues to edit at present. Later he became Chairman of Mahabodhi Center for Theravada Buddhist Studies, which is the only institution in India offering Diploma, B.A. and M.A. 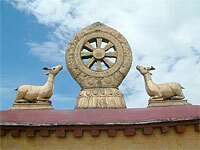 degree courses in Theravada Buddhism. He has given several public talks and conducted meditation programs both for people from India and the West. He is running special weekend classes on Abhidhamma, Buddhist ethical psychology, which has become a popular program in Bangalore.